It's almost Halloween guys! I hope you're as excited as I am for the best holiday of them all. I apologize for not posting anything last week. Honestly the week went by so quickly I barely got a chance to blink! 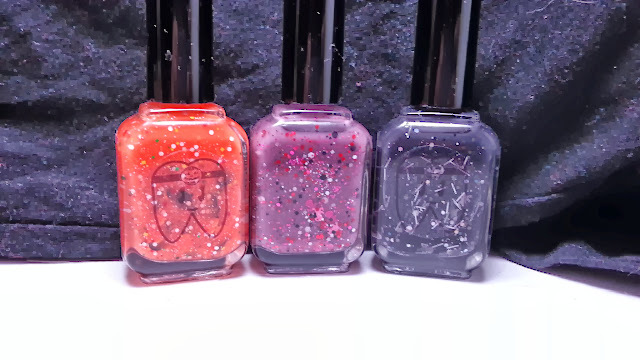 But I'm here to make it up to you guys with some swatches of the Hallowtide Tricks Collection by Doctor Lacquer. I'm a huge fan of Doctor Lacquer. It is without a doubt one of the most original indie lines out there right now. Top quality unique polishes, who the heck wouldn't want that! The Hallowtide Tricks Collection was released just a few days ago just in time for Halloween. This collection is limited edition though so I'm extremely happy I managed to get my hands on it. First we have... Pet Cemetery. Bonus points for the name cause I happened to be watching the horror movie while I did this swatch. 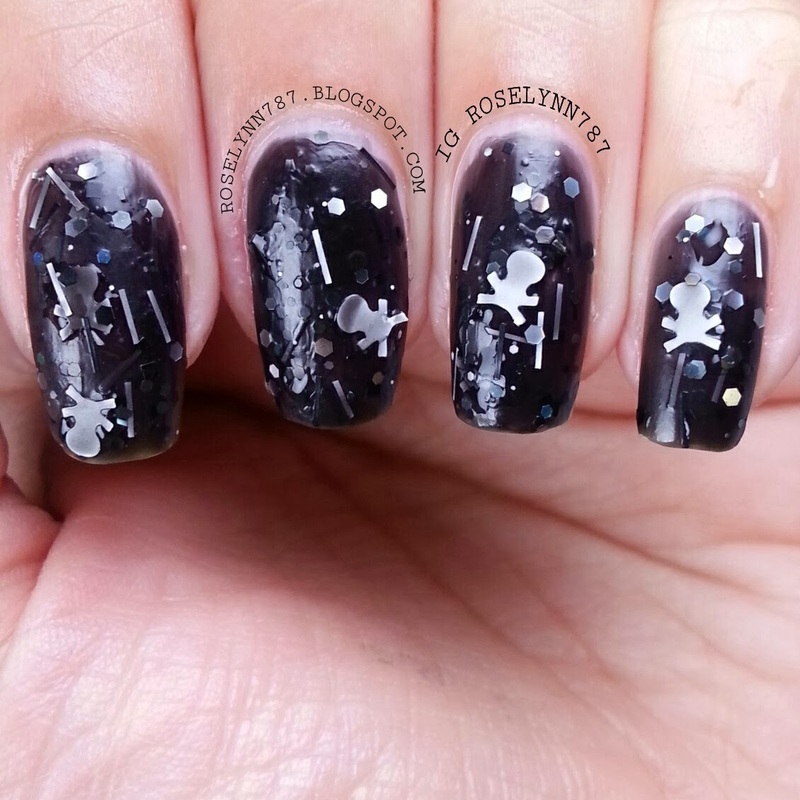 Pet Cemetery is a thermal polish that changes from black in a cold state to almost clear when warm. You can see the transition is awesome as pictured above! This swatch was done in 3 thin coats and no topcoat was added. I liked the smooth application. The change in color was flawless as well. When really cold, the shade of black is so intense. When warm, it did lightly up quite a bit but not completely see-through. 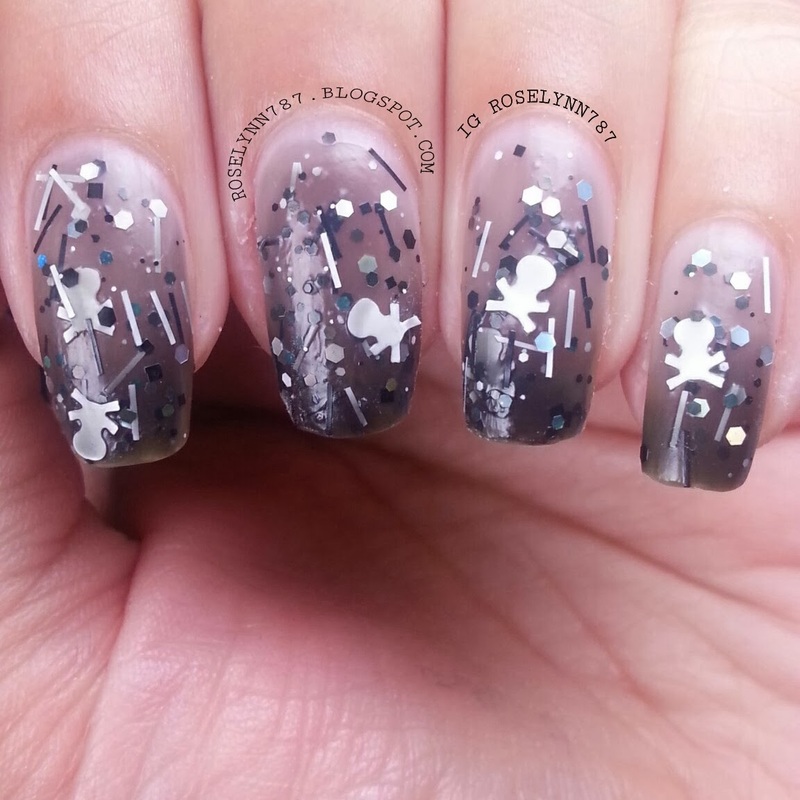 As you can see this thermal is filled with different glitters including white skulls with crossbones. It's the perfect addition to this beauty. 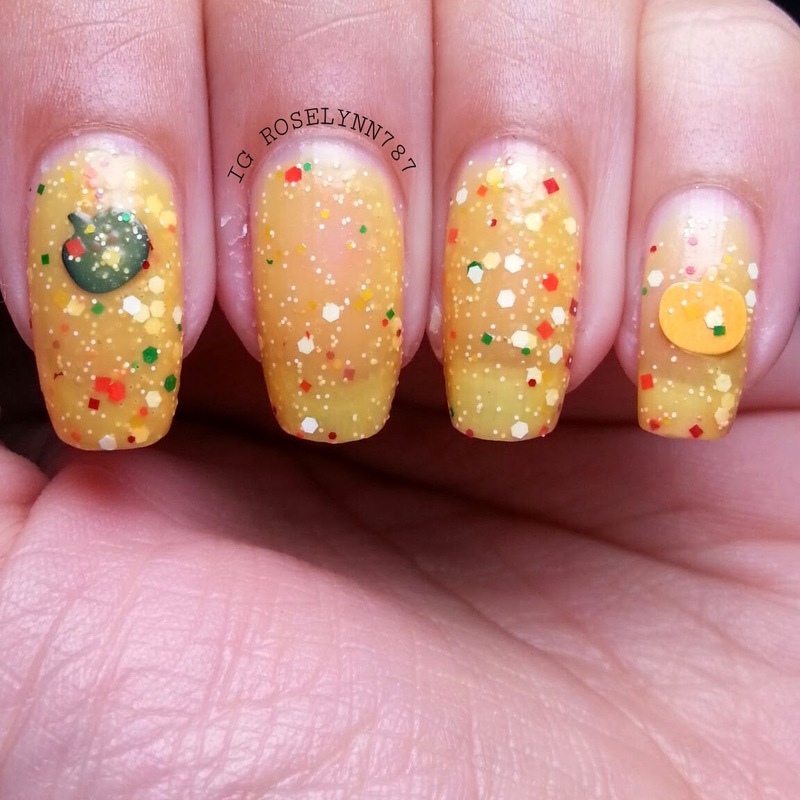 Also you can choose to have this polish with or without the bar glitters. 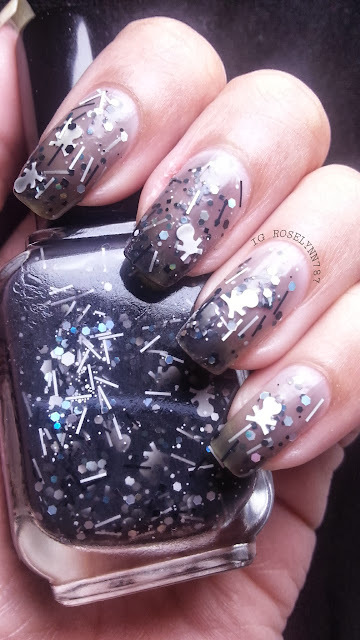 This swatch is obviously with the bars which I think adds a nice touch along with the other glitters. Next we have... Don't Drink The Pink-Aid! 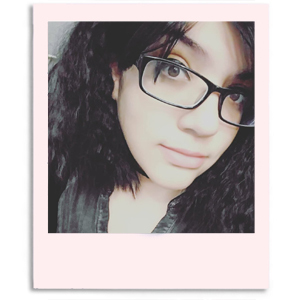 This thermal changes from plum to a dark brownish pink. I love the polish but I have to say the thermal change is kind of disappointing for me personally. I would of love to see a much more noticeable change in color in the transitions. 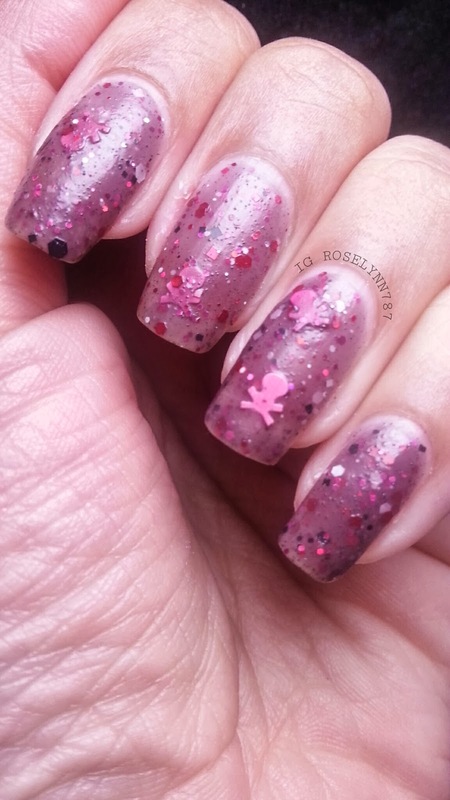 This thermal is filled with different colored circular glitters and cute pink skull and crossbones. 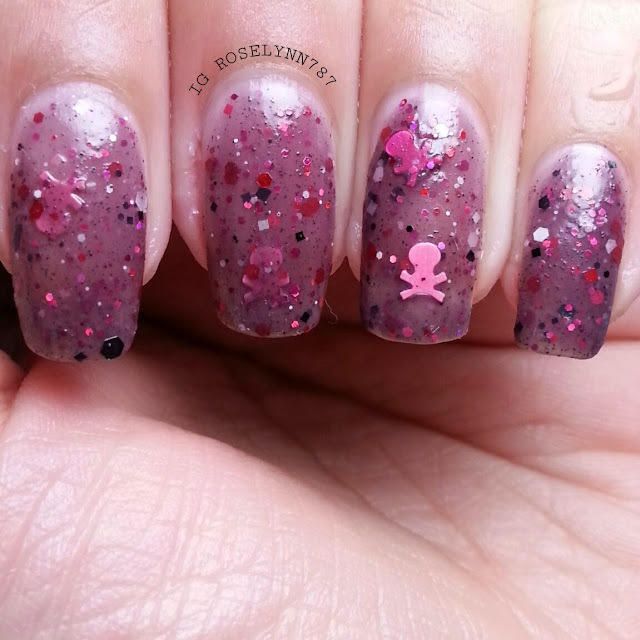 I did have trouble getting these little skulls from the bottle at first. Make sure you shake well before using and also in between coats. I left my bottle upside down for a few minutes and that helped as well. 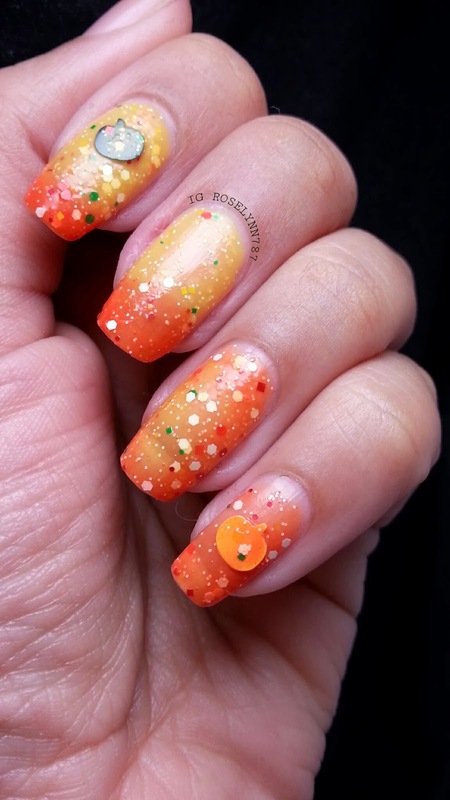 This swatch was completed with 3 coats and finished with a fast-drying topcoat. Last but certainly not least is Will-O-the-Wisp. Brace yourself for a crazy amount of swatch pictures. Needless to say this beauty is my favorite of this collection. Above is what Will-O-the-Wisp looks like in its warm state. 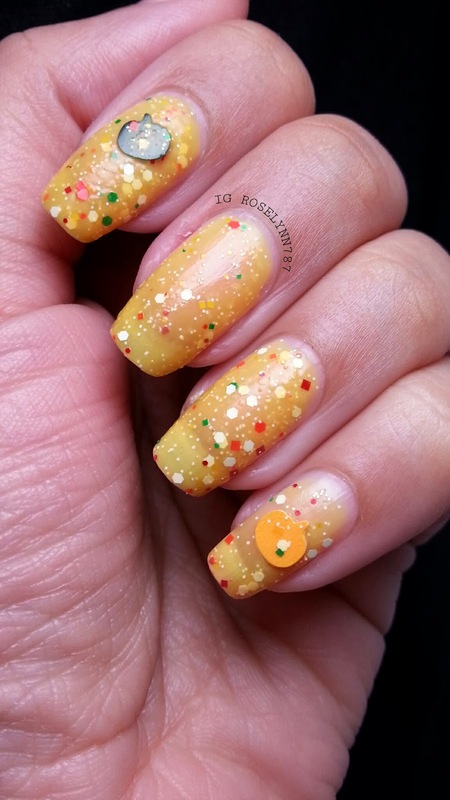 Beautiful shade of yellow filled with multi-colored glitters and of course with little pumpkin-shaped glitters! Will-O-the-Wisp is shown here in it's warm to cold transition. An absolute flawless and gorgeous transition. 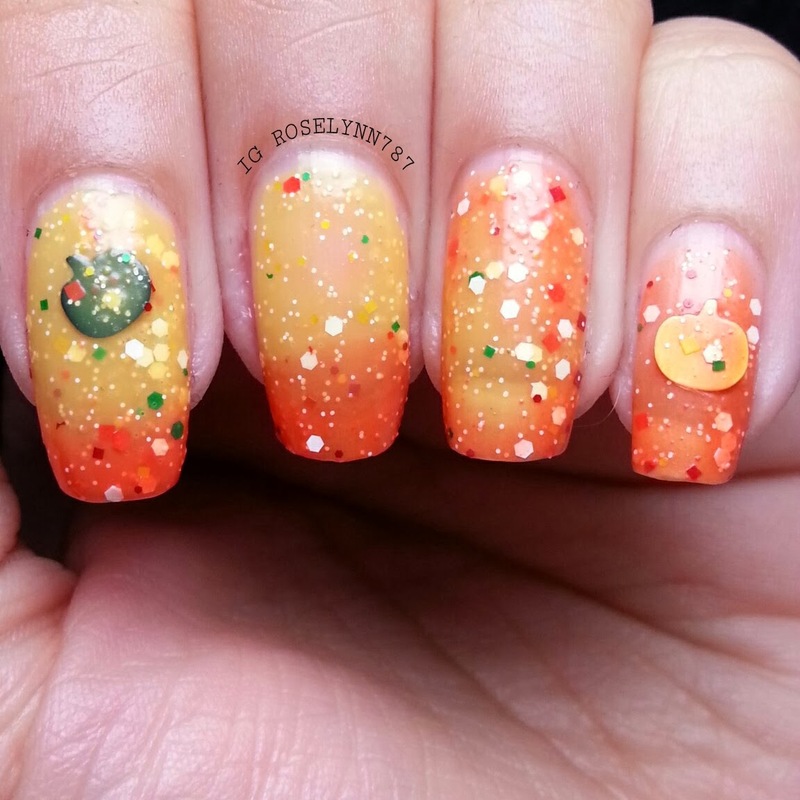 This polish has the most obvious and well-done color changing in this collection hands down! Honestly... it's actually one of the best thermal polishes I have experienced in any indie collection thus far. And finally this is Will-O-the-Wisp in it's complete cold stage. 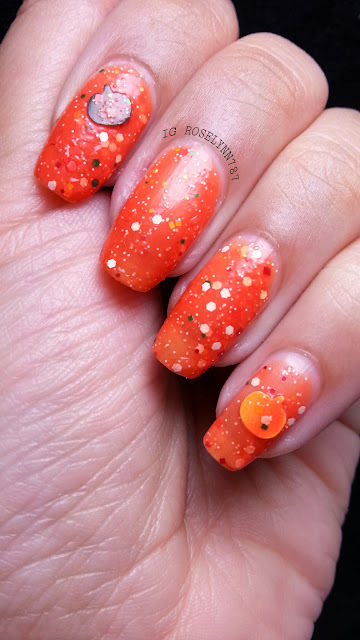 I love this shade of orange! Usually orange tends to make my skin tone look a little funny but this is the perfect tone. This swatch was completed in three coats except for my pinky was only used two. 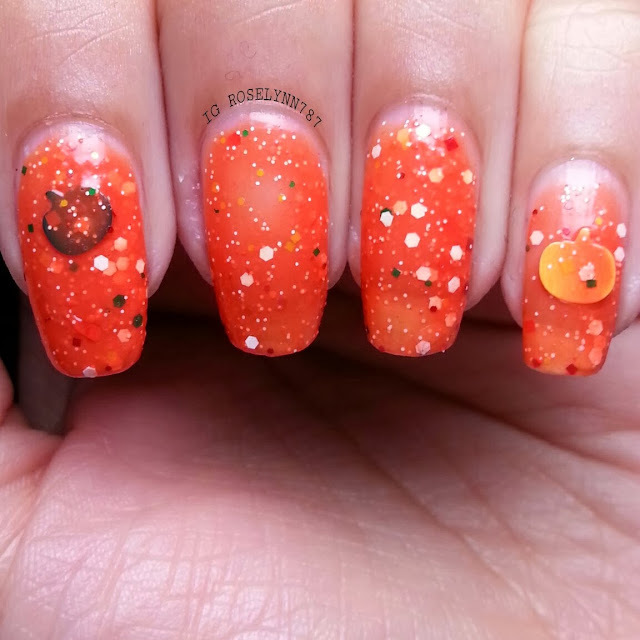 The application was excellent but like the other two, the larger glitters (the pumpkins), were a bit tougher to get out than the rest. As mentioned above, a few good shakes and keeping the bottle upside down a couple of minutes fixes the problem. This polish is not only my favorite of this collection but honestly a keeper for this whole season. 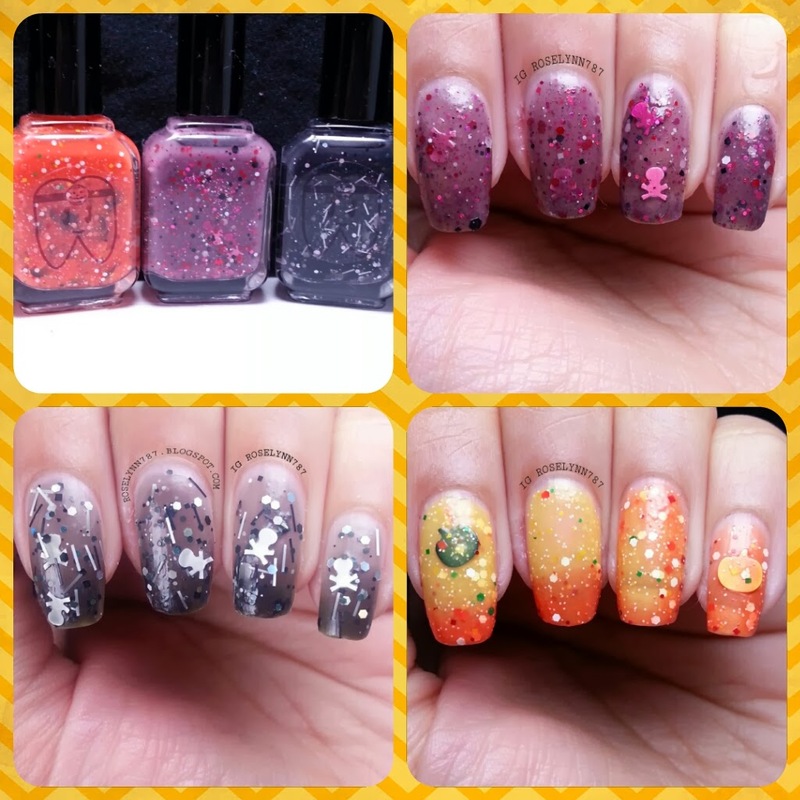 Head on over to Doctor Lacquer for the Hallowtide Tricks Collection and more stock information. Make sure you grab this limited edition collection before it's gone for good! You can also find Doctor Lacquer on Facebook and Instagram!